Math With Bad Drawings recently posted a mathematical horror story just in time for Halloween: The Polynomials That Were Annihilated One By One By Derivatives, As Told By The One Survivor (An Exponential Function). “Therefore,” the first series can be obtained from the second series by substituting . I placed “therefore” in quotation marks because this reasoning is completely invalid, even though it happens to stumble across the correct answer in this instance. The radius of convergence for the above Taylor series is 1, which can be verified by using the Ratio Test. So the series converges absolutely for and diverges for . The boundary of , on the other hand, has to be checked separately for convergence. In other words, plugging in might be a useful way to remember the formula, but it’s not a proof of the formula and certainly not a technique that I want to encourage students to use! However, I’ve been scratching my head to think of an example where plugging in the boundary point gives an incorrect answer because the series converges but converges to a different number. I could’ve sworn that I saw an example like this when I was a calculus student, but I can’t see to find an example in reading Apostol’s calculus text. 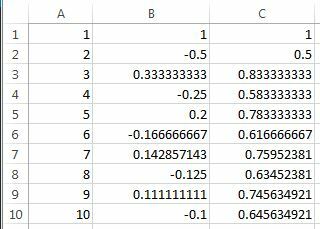 where two positive numbers alternate with a single negative term. By all rights, this shouldn’t affect anything… right? This step reveals why I added and subtracted the integrals above: those gymnastics were necessary in order to reach a limit that converges. which is different than . which is different than the original sum . which is the divergent harmonic series which was discussed earlier in this series. Therefore, the series converges conditionally and not absolutely. To calculate the value of , let , the th partial sum of . Since the series converges, we know that converges. Furthermore, the limit of any subsequence, like , must also converge to . Last summer, Math With Bad Drawings had a nice series on the notion of infinity that I recommend highly. This topic is a perennial struggle for math majors to grasp, and I like the approach that the author uses to sell this difficult notion. Part 3 on infinite series and products that are conditionally convergent discusses a head-scratching fact: according to the Riemann series theorem, the commutative and associative laws do not apply to conditionally convergent series. The top line is correct. 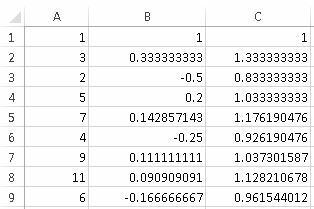 However, the bottom line has to be incorrect since but each factor on the right-hand side is less than 1. The error, of course, stems from conditional convergence (the terms in the top product cannot be rearranged). Conditional convergence is typically taught but glossed over in Calculus II since these rearrangements are such a head-scratching topic. I really like the above example because the flaw in the logic is made evidence after only three steps. In tomorrow’s post, I’ll continue with another example of rearranging the terms in a conditionally convergent series. diverges. However, if you eliminate from the harmonic series all of the fractions whose denominator contains a 9, then the new series converges! This series has been called the Kempner series, named after the mathematician who first published this result about 100 years ago. is less than or equal to , and so the sum of the above eight terms must be less than . is less than . Notice that there are terms in this sum since there are 8 possibilities for the first digit of the denominator (1 through 8) and 9 possibilities for the second digit (0 through 8). So the sum of these 72 terms must be less than . is less than . Notice that there are terms in this sum since there are 8 possibilities for the first digit of the denominator (1 through 8) and 9 possibilities for the second and third digits (0 through 8). So the sum of these terms must be less than . Using the formula for an infinite geometric series, we see that the Kempner series converges, and the sum of the Kempner series must be less than . Using the same type of reasoning, much sharper bounds for the sum of the Kempner series can also be found. This 100-year-old article from the American Mathematical Monthly demonstrates that the sum of the Kempner series is between and . For more information about approximating the sum of the Kempner series, see Mathworld and Wikipedia. It should be noted that there’s nothing particularly special about the number in the above discussion. If all denominators containing , or any finite pattern, are eliminated from the harmonic series, then the resulting series will always converge. diverges. This is a perennial head-scratcher for students, as the terms become smaller and smaller yet the infinite series diverges. Since , we can conclude that the harmonic series diverges. However, here’s an amazing fact which I hadn’t known before the Math With Bad Drawings post: if you eliminate from the harmonic series all of the fractions whose denominator contains a 9, then the new series converges! I’ll discuss the proof of this fact in tomorrow’s post. Until then, here’s a copy of the comic used in the Math With Bad Drawings post.